It’s impossible to avoid hearing about Montessori in your research for childcare, even if you aren’t looking for it. The term will pop up in conversation with other parents, appear in search results and you may even begin to notice Montessori centres around town. The positive reviews that I found were compelling and even after reading everything I could get my hands on, I still felt like I only had a vague idea of what Montessori entailed. I set out to find out more about what made so many parents passionate about the Montessori approach in developing independence, self-discipline and concentration. Learning materials aren’t like the Fisher and Price toys at other centres. 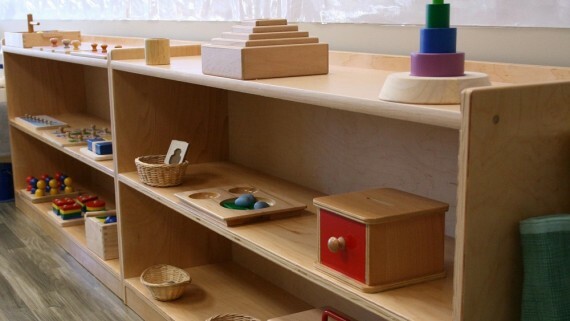 Bright coloured, wooden learning materials are typically associated with Montessori. Each design is carefully chosen to engage all the senses and build preparatory skills for further education. Learning materials support all educational areas in the classroom, including language, math, the environment, culture, music and practical life skills. The environment feels academic. All activities follow a process – Materials are arranged on a mat, checked when completed and returned to their original place. Uniforms can be a requirement for students, even as early as toddlers. Learning materials are designed to teach preparatory skills, so that once something has been mastered, the next task that they attempt will build on the learning that they completed first. It never gets too crazy or loud. The Montessori approach teaches students mindfulness to the environment around them. Good social behaviour is encouraged, especially manners. Even late in the afternoon you can expect to see children working peacefully on tasks and be able to hear music playing softly in the background. Learning also involves real-world objects. To teach practical life skills, activities use objects that a child will encounter in their everyday life. Activities can range from spooning seeds from one bowl to another, learning how to master using buttons or pouring water from a jug. Students are treated as capable from the get-go. Independence is encouraged, so children are never babied. Staff will always encourage students to learn self-care skills, like washing hands and cleaning up after themselves if a student shows signs of being ready. Order is a huge part of the classroom design. Rooms are organized into learning areas, and activities are designed to be completed from left to right. Classroom environments are well cared for and all items are always returned neatly. Individual learning is emphasized. Group activities like Circle Time are a part of the children’s day, but for the most part students work individually because they’re encouraged to interact with activities that take their interest. This is different to what I saw in traditional centres where a group of children would frequently work on the same activity together. In the Montessori classroom you’ll often see one child working on a language activity, while another works on a task that is at a different level and/or subject. Respect for learning materials. Importance is given to using learning materials with care and for their intended activity. For example, the wooden blocks representing mathematical units will never be used for building towers or as a toy to throw around the room. Scheduling mirrors the school system. A “full day” runs from 9.00am-3.30pm and any care required outside of those times is extra. Extra time, extra cost. In comparison, a traditional centre charges one fee for drop offs and pick ups at any time within centre opening hours. Montessori centres observe school year calendars and switch to a different program over the summer (July-August). Fees cost more than most daycare centres. This will depend a lot on your circumstance – What you pay will vary on the drop off and pick up times that suit you. A drop off time of 7am will generally cost more than a drop off time of 8am, and lunch fees are additional. I’ve found that Montessori centres can cost approximately $200-300 more than a traditional day care centre. If you are curious about Montessori, I strongly suggest touring at least two different certified centres. I’ve visited multiple accredited centres and felt differently each time. Staff can make a huge difference, so give yourself some room to learn if Montessori could work for your child. If you find that you like one aspect of what you find in a Montessori daycare but not others, talk it over with potential care providers. They’ll be quick to point you in the right direction and let you know if their centre is one that’s suited for you. The Montessori vs traditional education approach can be a heated one, and I’ve done my best here to report on what I’ve found. Do you have a different perspective that you can offer to another parent? What did you find in your own research that helped you decide?